Calcareous is an adjective meaning "mostly or partly composed of calcium carbonate", in other words, containing lime or being chalky. The term is used in a wide variety of scientific disciplines. Calcareous is used as an adjectival term applied to anatomical structures which are made primarily of calcium carbonate, in animals such as gastropods, i.e., snails, specifically about such structures as the operculum, the clausilium, and the love dart. The term also applies to the calcium carbonate tests of often more or less microscopic Foraminifera. Note that not all tests are calcareous; diatoms and radiolaria have siliceous tests. The molluscs are calcareous, as are calcareous sponges (Porifera), that have spicules which are made of calcium carbonate. The term is used in pathology, for example in calcareous conjunctivitis, and when referring to calcareous metastasis or calcareous deposits, which may both be removed surgically. The term calcareous can be applied to a sediment, sedimentary rock, or soil type which is formed from, or contains a high proportion of, calcium carbonate in the form of calcite or aragonite. 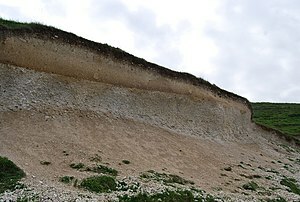 Calcareous sediments are usually deposited in shallow water near land, since the carbonate is precipitated by marine organisms that need land-derived nutrients. Generally speaking, the farther from land sediments fall, the less calcareous they are. Some areas can have interbedded calcareous sediments due to storms, or changes in ocean currents. Calcareous ooze is a form of calcium carbonate derived from planktonic organisms that accumulates on the sea floor. This can only occur if the ocean is shallower than the carbonate compensation depth (CCD). Below this depth, calcium carbonate begins to dissolve in the ocean, and only non-calcareous sediments are stable, such as siliceous ooze or pelagic red clay. Calcareous soils are relatively alkaline, in other words they have a high pH. This is because of the very weak acidity of carbonic acid. Note that this is not the only reason for a high soil pH. They are characterized by the presence of calcium carbonate in the parent material and may have a calcic horizon, a layer of secondary accumulation of carbonates (usually calcium or Mg) in excess of 15% calcium carbonate equivalent and at least 5% more carbonate than an underlying layer. Calcareous deposits can form in water carrying pipes. An example of this is Sunday stone. Calcareous coatings, or calcareous deposits, are mixtures of calcium carbonate and magnesium hydroxide that are deposited on cathodically protected surfaces because of the increased pH adjacent to the surface. ^ a b Murphy, Richard C. (2002). Coral Reefs: Cities Under The Seas. The Darwin Press, Inc. ISBN 0-87850-138-X. ^ "Diagnostic horizons, properties and materials". Lecture notes on the major soils of the world. FAO. Retrieved 14 June 2014. ^ a b Pearn, John H; Gardner-Thorpe, Christopher (11 July 2013). "11 July 2013". Geological Society, London, Special Publications. 375: 269–278. doi:10.1144/SP375.22. Retrieved 17 July 2018.